Concerns have been raised over the safety of a road in Battle, following a collision which resulted in a 12-year-old boy being airlifted to hospital. More than 500 people have signed a petition calling for the speed limit on Battle Hill to be cut to 20mph. The campaign was launched by Battle resident Victoria Wilken, who said she felt “shocked and appalled” by the speed of motorists. On her campaign page, Victoria wrote: “I moved into Battle 18 months ago. I’ve been shocked and appalled by how fast motorists travel along the Battle Hill route to and from Lower Lake. My daughter attends Claverham School and walks every day to and from school. “It is a constant worry as the cars regularly speed up and down the hill. I was upset to hear that a young boy was recently hit by a car and then airlifted to hospital. “As a parent, it is heart-wrenching to hear of any child being hurt. She added: “I often need to cross the road to visit Tesco Express. I sometimes feel as if I’m running for my life when I cross that road. “I won’t let my twelve-year-old cross because it is so dangerous. Imagine if it was your child or your elderly relative trying to cross. “The pavement across the bridge is worn down because of the amount of cars that have driven up onto the curb to turn the corner as they are travelling up the hill. “It is already a narrow path with a bend where motorists cannot see if people are walking along or about to cross over the road. “Please sign this petition to stand with me and the local community to say ‘change the speed limit in Battle, East Sussex to 20mph, before you kill somebody’. An East Sussex County Council spokesman said: “We are aware of the concerns of local residents. As we only have very limited funds for road safety schemes, we have to focus our resources on the areas of greatest need and assess a scheme based on a range of criteria. The 12-year-old boy was injured in the collision last Thursday (March 15). He was airlifted to hospital in London by the Kent, Surrey and Sussex Air Ambulance for emergency treatment after the collison. He was later discharged the same day. There is no suggestion that the driver was speeding at the time of the collision. 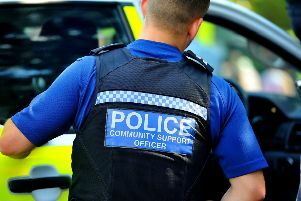 A 45-year-old woman from Hastings was arrested on suspicion of failing to stop and driving under the influence of drugs. She has since been released under investigation while enquiries continue. For more details about Ms Wilken’s campaign or to sign the change.org petition yourself use the website link – https://bit.ly/2IKKaEY.